Stripe is an online credit and debit card payment service that ChurchSuite uses to handle card payments for "pay" event tickets, online card donations and online booking charge payments. It’s a really useful feature that’s quick and easy to set up. Click on the Administrator menu in the top right-hand corner of ChurchSuite (you will need to be an Administrator to see this menu option). 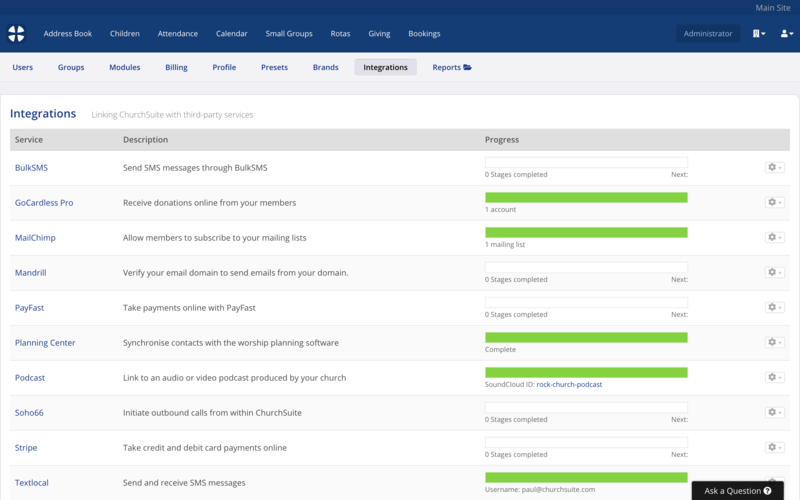 Click on the Integrations menu and select Stripe. Follow the on-screen instructions to complete the Integration. After reading the instructions on the above page, click Save and Proceed to continue. The Stripe account application form opens - on this page you can either open a new Stripe account, or click Sign in if you already have an account. 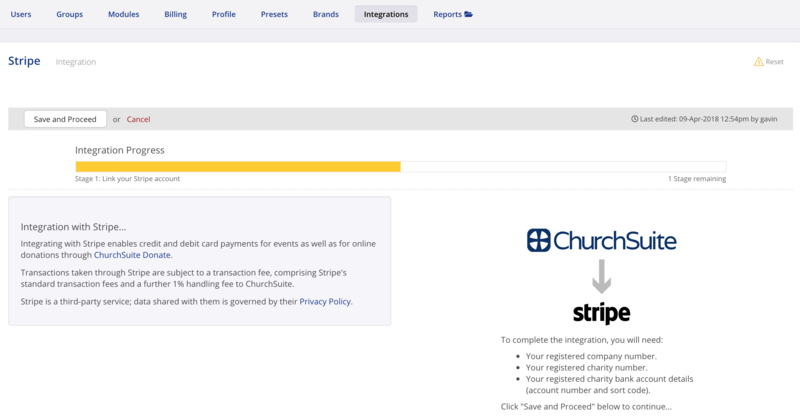 At the bottom of the page click to Authorize the ChurchSuite Integration to access your Stripe account. When you first open a new account with Stripe, select your Country and Your product sections. Continuing down the page, specify your Type of business - select Nonprofit organization. 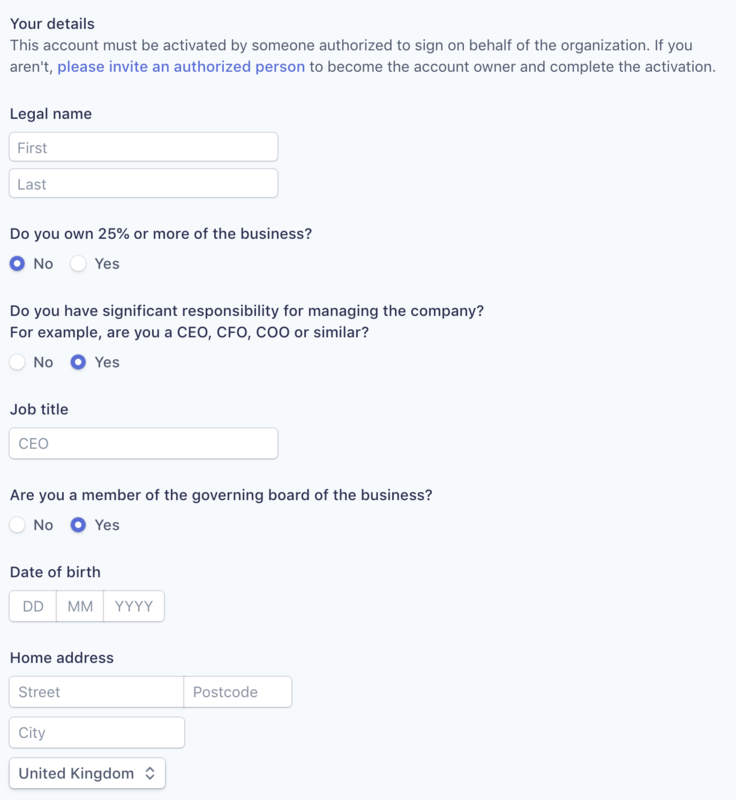 Ignoring the slightly misleading 'company' terminology on Stripe's form, complete the form fully. For Company number, enter your charity number, adding leading zeros to ensure the number is 8 digits. And finally answer the remaining questions and enter your organisation's bank details. 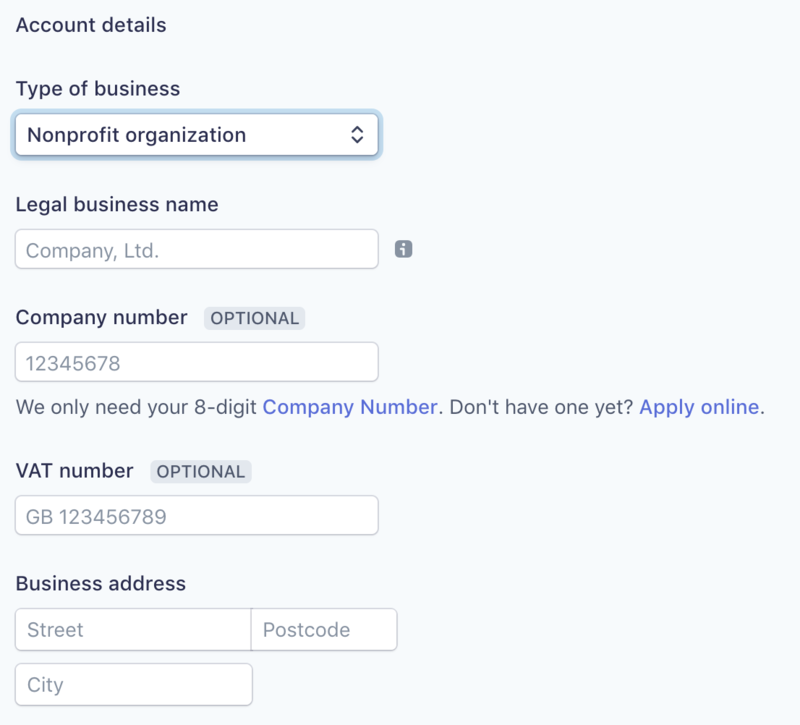 ...Stripe assure us that they will correctly designate your account as a "non-profit" and you can still proceed and complete the Stripe integration. At this stage the account-opening process is simply inviting you to make a direct debit request. Complete the set up process by clicking to Authorize access to this account (which will complete the linking between your Stripe account and ChurchSuite and activate your Stripe account). Stripe will now work with you directly by providing you with a Direct Debit Form that has space for multiple signatories. To request a direct debit form, simply write to Stripe at support.stripe.com/email. They'll email you a direct debit mandate that includes their/your DD reference, which can then be completed, signed and returned back to Stripe as per their instructions. They also recommend sending a copy of the mandate to your bank. For further information, see Stripe's support page on multi-signatory mandates. 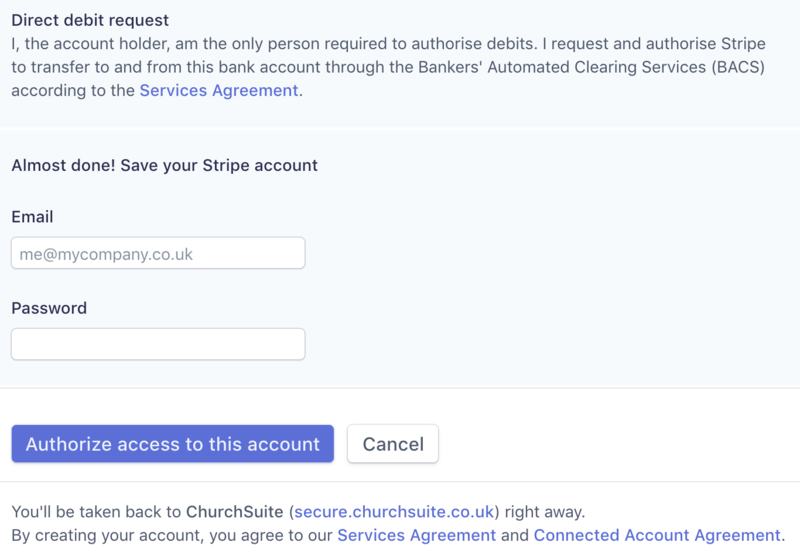 Having created a new Stripe account and authorised the ChurchSuite integration to use the account, you are then returned back to the ChurchSuite Stripe Integration page to finish. Review and set any optional Checkout Options, including whether a billing address should be entered, or whether to disable Apple Pay. The use of Apple Pay may require you to log in to your Stripe account dashboard to accept the terms and conditions of use. Apple Pay is currently only available for event ticket purchases made via our iOS app or a Safari browser - Apple do not (currently) permit the use of Apply Pay for card donations. Apple Pay only works with Safari web browsers. Note that you can Integrate additional bank accounts if you wish - perhaps if you have different bank accounts for donations to different Giving module Funds. Once you have created your additional Stripe account just click Add another account to proceed. 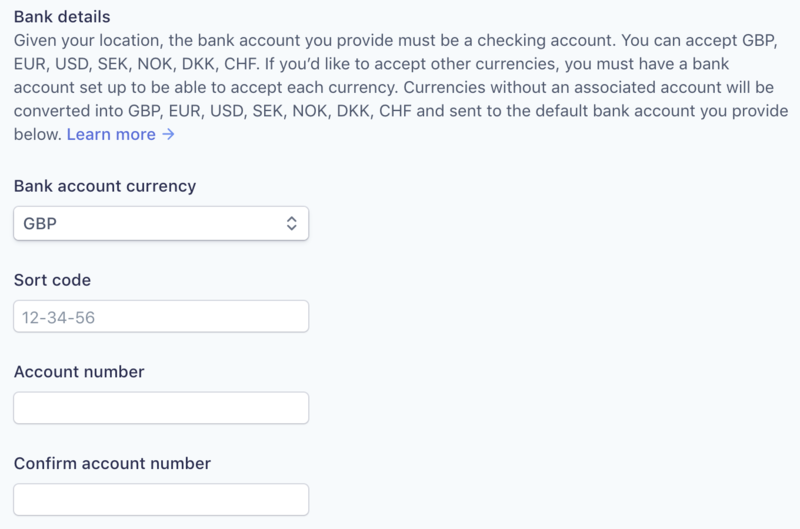 Ensure you are logged in to the Stripe account you want to add before selecting this option - Stripe have indicated that it's possible to add multiple bank accounts to a single Stripe account - see here. Congratulations! 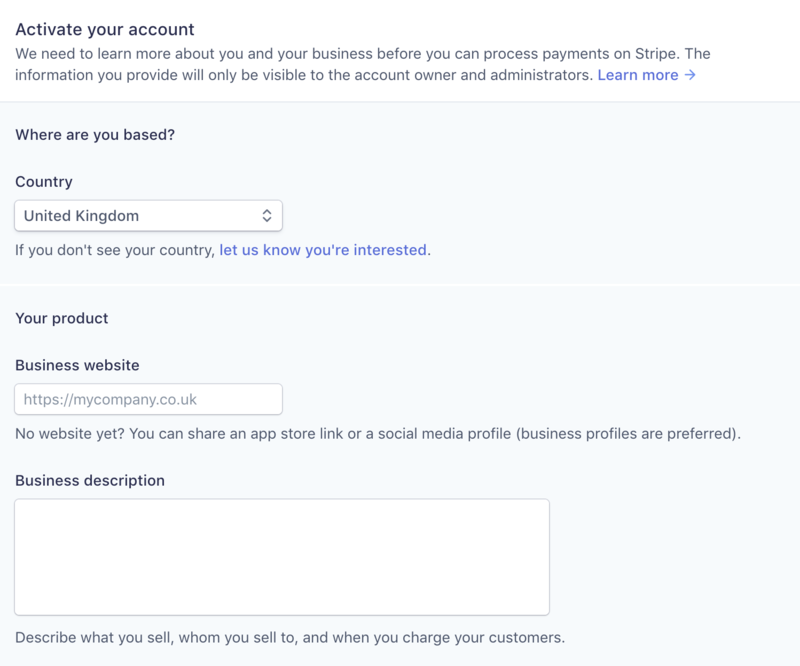 Stripe is now be fully integrated with your account. Now, when you add "pay" tickets to an event, or enable online giving through Donate or add charges to bookings, you'll be able to receive card payments. Card payments are paid directly in to your designated church bank account by Stripe (no card details are held within ChurchSuite) - typically Stripe transfer monies to your bank account in batches every few days, and within approximately 2-7 days of the event sign-up. You can also change the transfer frequency within your Stripe account settings. See the related support article on Stripe Transfers to help you reconcile your net transfers received in your bank account back to the gross ticket sales for your events.